** Fun Fact: Linda Vista is one of the few places in the world where you can go from Pre-School to PhD all within the same neighborhood! 2018's theme celebrated Our History, Our Stories! It emphasized the beautiful history of Linda Vista and San Diego. We invite you to participate in this day-long event by renting a booth in order to share your culture and organization with the many fair-goers. Booth space assignments will be made on a first-come, first-served basis, according to the date the completed registration form and payment are received. If you would like a booth space at the fair, the form is available by clicking here - Vendor Application! Fill out the application, print and return to us! We look forward to seeing all your smiling faces at the fair on April 27, 2019! 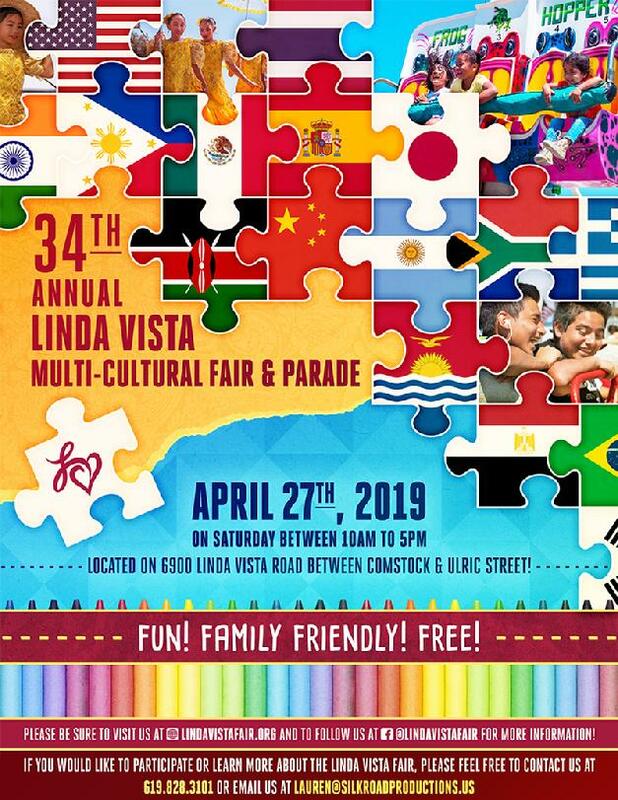 The Linda Vista Multi-Cultural Fair is a drug, cigarette, and alcohol-free event. Tobacco/drug paraphernalia, or any item that promotes the use of illicit substances is prohibited from being sold.